Mayan civilization. Today it’s home to some of the most famous UNESCO world heritage archaeological sites, like Tikal and El Mirador, that give us a glimpse into ancient Mayan life and remain protected under verdant canopies of natural rainforest jungles inhabited by indigenous wildlife. The best way to reach Petén is to fly to the charming colonial town of Flores, which is only 50 minutes by plane from Guatemala City. One of the best places to stay to explore and experience the natural beauty of this fascinating region is at the eco luxury boutique hotel, Las Lagunas, located just outside of Flores. Set on 300 lush acres of a nature preserve on the shore of the Quexil Lagoon, there are 19 luxuriously appointed over-lagoon bungalows that seamlessly blend nature and eco-tourism, making it a perfect spot to recharge after a long day out touring. Guests can wake up to the chirping sounds of native birds and fall asleep to the cacophony of howler monkeys. 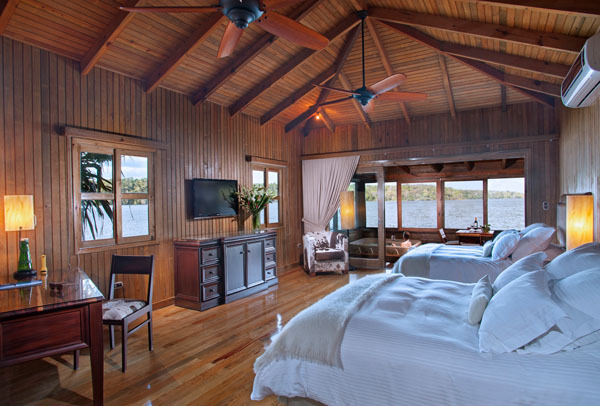 The spacious bungalows feature a rustic chic décor with plush beds, marble showers, and private decks with Jacuzzis to enjoy the solitude of the lush jungle atmosphere with breathtaking views over the lagoon. Enjoy the best of Guatemalan cuisine at Shultun Restaurant led by Executive Chef Michael Muller. Some of the specialties of the house are sourced from local markets with an international flair. Highlights from the menu include clams in a white wine broth, blanco fish over portabello mushrooms, an avocado tower with smoked salmon, and grilled lamb chops with a honey glaze sauce. While on the property there are many activities at your disposal. Take a boat tour through the Quexil lagoon to one of the islands that offer a refuge to rescued spider monkeys. Bask in the quiet solitude of the jungle and cool off in their crescent- shaped infinity pool overlooking the lagoon. Learn about the history of the region in the hotel’s museum that displays the owner’s personal collection of priceless archaeological artifacts from Guatemala’s three major regions: the Petén Region, Lowlands, and Highlands. Most of the pieces from Petén are Mayan and date from 450 BC to 900 AD. After a day of exploring the famous ruins of Tikal, Uaxactún, and Yaxhá take the time to relax and restore the mind, body, and soul at Las Lagunas’ new 5,400-square-foot spa. Nature and wellness become one in this Mayan oasis replete with a beauty salon, steam room, swimming pool, Jacuzzi, and three treatment rooms. The signature treatments reflect the healing rituals of the Mayan culture, including their hot stone massage using jade gemstones that aid in detoxification while strengthening the body’s filtration and cleansing systems. Afterward connect with your ancestors through a Mayan ritual led by a shaman in the heart of the jungle that will open your mind and deepen your understanding of this ancient culture. Las Lagunas also offers six different tours to the region’s most famous historical UNESCO heritage sites. 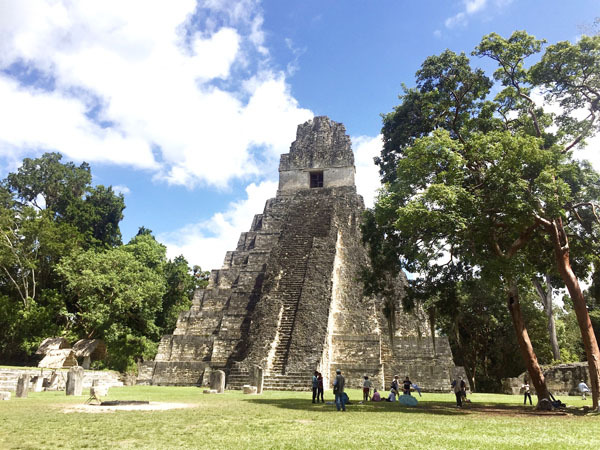 Spend the morning exploring the Lost World of Tikal with over 4,000 structures, including the tallest building in Mesoamerica. The ethereal and otherworldly landscape of Tikal also served as a film location for the rebel base of Yavin 4 in Star Wars: Episode IV A New Hope. Additionally, the third largest archaeological site in Guatemala, Yaxha is within a day’s drive from the hotel. This secluded ancient city offers mesmerizing sunset views from the top of its temple with diffused rays setting over the jungle and with the sounds of howler monkeys in the background, providing an experience that will stay with you forever.